Main Vert Ramp, West Beach. West Beach Skatepark, Adelaide, South Australia, is one of my favorite skateparks, even though I can barely skate anything in it well. Most of the park is way above my ability. Located not far from the end of the runway at Adelaide Airport it can be a bit disconcerting seeing how low the planes get as they come in to land. From certain vantage points you'd swear they're about to crash into the park instead of fly over to the runway. The park is nearly an hour's drive from my house in Gawler so the only time I get to visit is if I'm dropping my partner off at the airport (which is a rare occurrence). This particular day was a hot 41 degrees celsius. I didn't think I'd skate but the heat guaranteed the park to be virtually empty (except for one other skater who lasted about as long as I did before giving it away). Below is a video with some highlights from my, about an hour long, session. As you can see, my ability is limited to just keeping myself moving on both the big bowl and the main metal vert ramp. The street section is mostly a couple of steep-ish banks, rail sliders and the tiny manual pad you see me skating in the video. There is also a mini bowl/snake-run, that is ideal for beginners, but I suspect would be pretty busy on cooler days. I didn't get a lot of footage of me skating because it was pretty windy and I didn't have a tripod that would stay standing for long. That's why the camera is set so far away from the vert ramp. It was in a spot out of the wind. As I mentioned earlier this park is one of my favorites. Largely because of the metal vert ramp, which is one of the largest ramps I've ever seen in person. Even though I can't skate it well it represents 'potential' for me. I don't think I'll ever get to skating a ramp that big with any confidence but I like to imagine those who can. Vert skating is the pinnacle of the sport in my eyes. 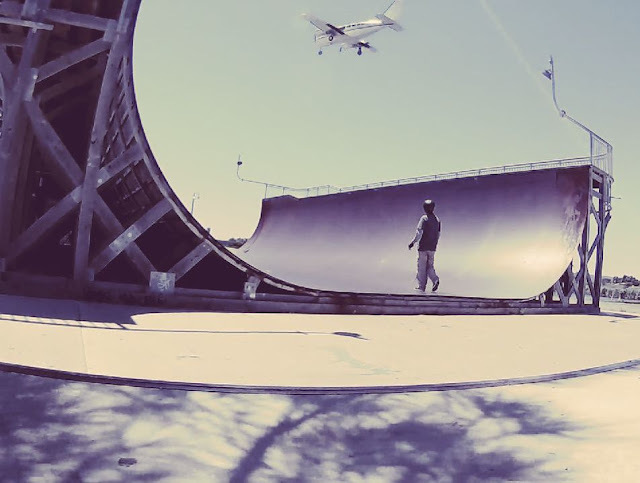 There's nothing better than watching someone skate vert well. Also at the park is a skate shop and kiosk. Well worth checking out whilst you're there if you're thinking about replacing any part of your skateboard or just need to buy a drink.